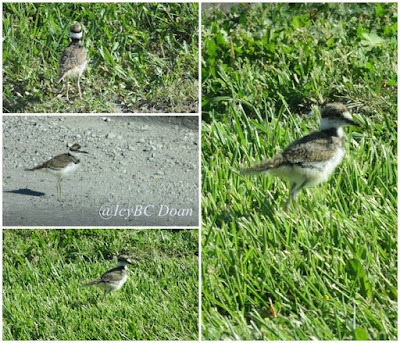 It was four years ago that I saw a killdeer bird in the neighborhood. I have moved, and this will be my second year in a new one. My condo complex and the adjacent one in the back is not a suitable environment for many wildlife critters. However, once in awhile I saw a blue jay, or a cardinal, or a woodpecker, I get all excited. I knew their signature voice by heart. On my way home one day, I saw a group of baby killdeers crossing the road, and I had to stop in the middle of traffic waiting for them, plus took snapshots. They were so fuzzy and cute! I am glad that this family of killdeers were a success and healthy. Since then, I haven't seen them again.